Oh boy, here we go again! It was a big relief to see the little blob on the screen with a tiny flickering heart. Yes, a heart! It was beating nice and fast! Hooray! No bad news today! Everything looked fine, even though Baby basically looked like long blob instead of a recognizable human shape. I think he or she was positioned at an awkward angle. I mean, I know it’s still very early, but, at 9 weeks, my previous babies had a recognizable head and body, with little bitty stumps where the limbs would grow. 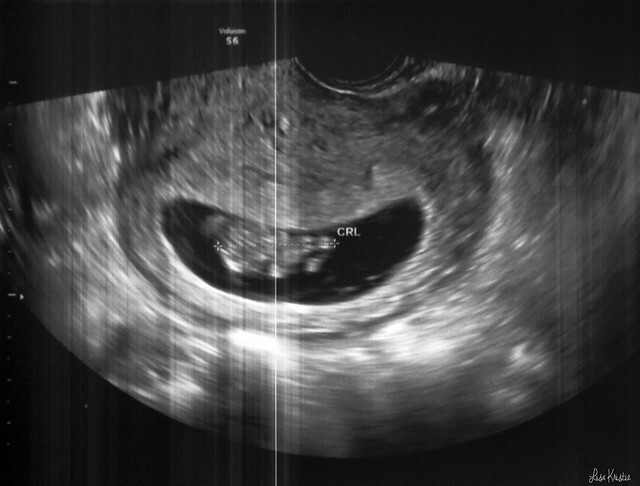 Anyway, our peanut measured 2.7cm at 9 weeks + 4 days. The estimated due date is March 11th 2018. Almost my dad’s birthday (March 10th). This little one will most likely be induced a bit earlier, just like Emery was. So we’re either looking at the end of February or very early March. Gert joked that he or she should be born on my birthday, March 4th, so we’ll have 3 generations in a row born on that day: my mom, me, and little one. I doubt it will happen though. March 4th 2018 happens to be on a Sunday, and there’s no way they’re going to induce on a weekend. I’m really not fussed about the exact day. As long as all goes well and we end up with another healthy baby! Next appointment: August 29th. I will already be 12 weeks! Can’t believe this will be the start of my second trimester already. I can tell the timing of this pregnancy will make it seem like it’s going to fly by. What a difference with Sam. I carried him from January to September, and it felt like an elephant pregnancy. Boy, there was just no end in sight. I think it seems shorter when it’s spread over 2 different calendar years, with Christmas and New Year in between. Because that was the case with Emery too, and it didn’t feel quite as slow as it did with Sam. Anyway, that’s about it for now. Obviously, I’m keeping this blog post private at the moment, and will make it public later on. I’ve been keeping a low profile for months now. There’s no specific reason, really. I’ve just been busy and was focused on a million different things. Suddenly the blog didn’t seem like a priority anymore. But it’s nice to document my babies’ early stages. So perhaps this is a good excuse to get back into the swing of things.